Photograph of the upper verandah of the Rani Gumpha, Udayagiri, taken by W.H.Cornish in c.1892, Archaeological Survey of India Collections. The Jain caves in the twin hills of Khandgiri, or Khandagiri, and Udayagiri, were excavated in the 1st century B.C during the Chedi dynasty of ancient Kalinga (now Orissa). The Rani Gumpha or the Queen's Cave is the largest and most elaborately decorated cave. It has a double storey, with a spacious courtyard. This view shows a cell entrance of the upper floor flanked by two pilasters with winged animals as capitals that support a carved arch decorated with flowers and animals. 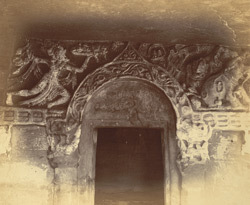 The arches above the doorways are connected by a sculptural frieze; the section in this view shows a vidyadhara flying with offerings of garlands on the right and a forest scene on the left.